Indeed, I spent several years riding in the back, and never liked it that much. It was OK, but more often than not it felt cramped, inevitably introducing the occasional CLANK, when two helmets gently collide. Bumpy, unwelcoming roads are part of the game. In short, it happened for two reasons: first, I started talking about how I’d like to ride by myself, following a trip with my husband. I never knew whether I truly meant it, but I felt like saying it, I felt like wishing it were true and said it out loud. Second, he took me seriously. 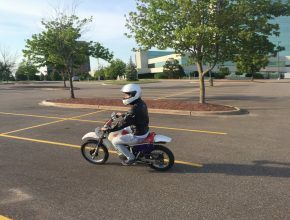 One day I returned home from work to find a Honda 80cc, a little dirt bike sitting in our garage–my gradual introduction to motorcycle riding–and it was the best thing I could have asked for. Once I figured out my baby steps, I gained just enough confidence to transfer my knowledge to a real motorcycle. I was riding in a parking-lot, but already could tell what potential lies ahead… the unparalleled pleasure of riding a motorcycle. My husband’s support and encouragement were integral to my success. Days later, I enrolled the MSF course offered at a nearby community college. I got my license and the rest is history. Truthfully, I am still in disbelief. Whenever I get on the bike, a surreal sense of “how did I do this?” and “are these my hands on the handle bars?” washes over me, but quickly, like everything else in life, it all peels away leaving only a continuous flow of calming perception, registered by my senses. I am sure my doubts will eventually disappear. The persistent dread of making the deadline, following one’s passions, “making it,” achieving goals, being part of the Western Race-to-Success…the never-ending inner voice chattering all day… all of it–gone. I am left with the sound and vibration of the motor under me, the powerful stirring and gear-changing as I command the bike forward. The chill in the air and the rustle of the leaves as the motorcycle carves through life like nothing else in the world. I embrace the breeze sneaking through a small gap, when the visor is nearly but not fully closed. The sun, illuminating the beautiful country road and the occasional potent and all too familiar smell of cattle and manure. The world has disappeared, yet fully rediscovered in its truest form: I travel through Wisconsin’s natural beauty and experience nothing but awe and gratitude. I am fully present, in the moment; the qualities of life research has shown to promote genuine happiness and contentment. Psychology studies, and Buddhism. I’m here, right now, with my bike, and nothing else matters. 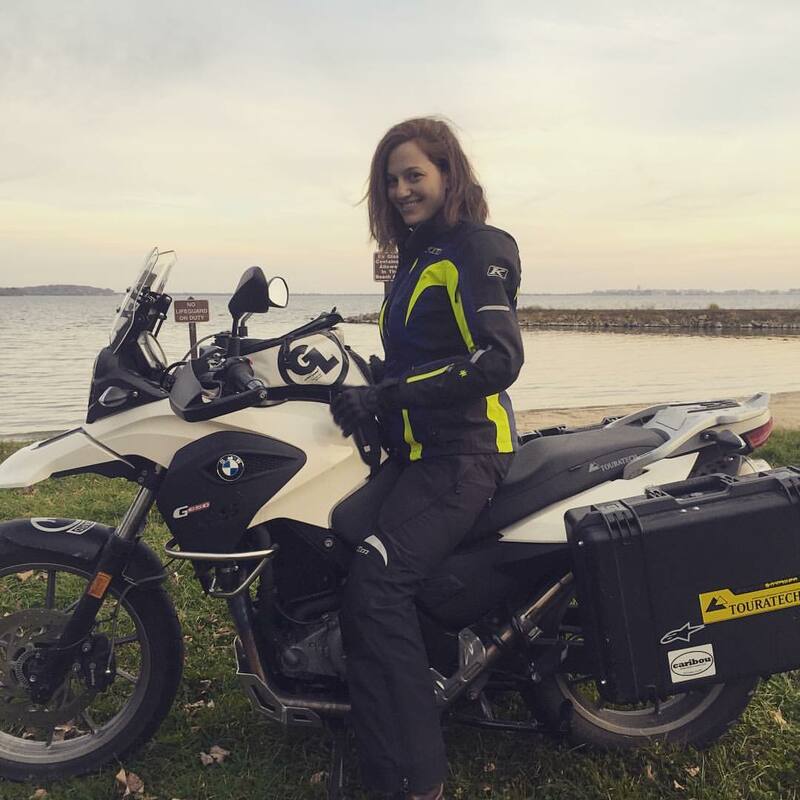 It turns out, the motorcycle–the vehicle I was never meant to try–has become one of my favorite ways to find immediate peace, reconnect, and enjoy life. Which is why I have become the most annoying buddy, constantly encouraging fellow ladies to learn how to ride and finally understand what it is their boyfriend/husband/partner is so obsessed with. It’s an obsession, an addiction, because it’s flipping awesome.